So you think you’ve seen and/or own every old foreign zombie flick? Like the one where zombies crawl out of gothic catacombs and use karate on superheroes, or the one where the walking dead torture kidnapped villagers with electric cattle prods in a mad scientist’s dungeon laboratory. Oh, and then the one with the zombified wrestler called Satan who comes back from the dead for a grudge match with the grandson of his old rival. 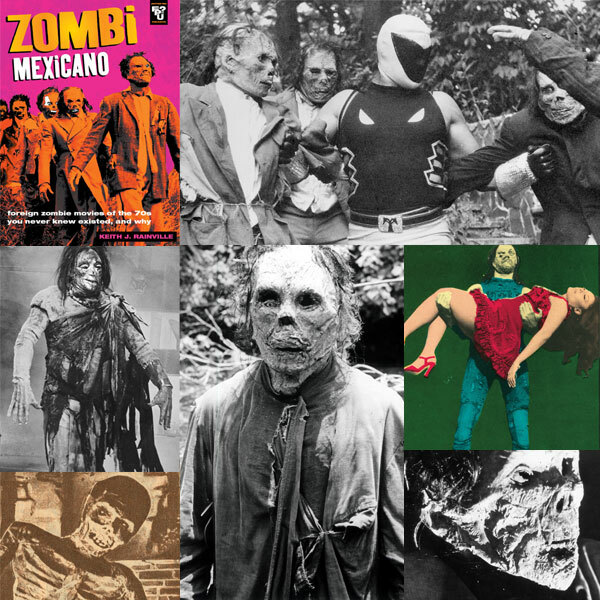 Las momias de Guanajuato and a half-dozen or so sequels and related films are perhaps the most obscure 1970s ZOMBIE movies ever, rarely if ever making the “definitive encyclopedias of” and “complete guides to” books on the zombie genre. Maybe there’s an assumption these are just more Aztec Mummy flicks, maybe the very inference of a bandaged shambler disqualifies them in the minds of purists, maybe it’s just pure ignorance of South of the Border monster movies. Regardless, these films, chock full of walking dead bursting their way our of graves and catacombs, attacking the living in hordes with mindless abandon, should have been part of the vintage zombie canon all along. We’re hoping this book, packed with close-ups of living corpses attacking our beloved lucha-heroes can help set that record straight and create some demand for this largely ignored sub-genre. ZOMBI MEXICANO is a squarebound, 64-page photo book printed on a high-end Indigo press for an eye-popping boutique quality collectible. 11.5×11″ format, heavy semi-gloss stock with profuse color and B&W photos and illustrations throughout. We’ve just uncovered a half-dozen or so copies of this long sold-out tome and have put them up for grabs, first come first served! BUY NOW in our new WEB STORE!